A protocol for the quantitative, high throughput expression screening and analytical purification of fusion proteins from small-scale Escherichia coli cultures is described and applied to the expression of disulfide-rich animal venom protein targets. Saez, N. J., Nozach, H., Blemont, M., Vincentelli, R. High Throughput Quantitative Expression Screening and Purification Applied to Recombinant Disulfide-rich Venom Proteins Produced in E. coli. J. Vis. Exp. (89), e51464, doi:10.3791/51464 (2014). Escherichia coli (E. coli) is the most widely used expression system for the production of recombinant proteins for structural and functional studies. However, purifying proteins is sometimes challenging since many proteins are expressed in an insoluble form. When working with difficult or multiple targets it is therefore recommended to use high throughput (HTP) protein expression screening on a small scale (1-4 ml cultures) to quickly identify conditions for soluble expression. To cope with the various structural genomics programs of the lab, a quantitative (within a range of 0.1-100 mg/L culture of recombinant protein) and HTP protein expression screening protocol was implemented and validated on thousands of proteins. The protocols were automated with the use of a liquid handling robot but can also be performed manually without specialized equipment. Disulfide-rich venom proteins are gaining increasing recognition for their potential as therapeutic drug leads. They can be highly potent and selective, but their complex disulfide bond networks make them challenging to produce. As a member of the FP7 European Venomics project (www.venomics.eu), our challenge is to develop successful production strategies with the aim of producing thousands of novel venom proteins for functional characterization. Aided by the redox properties of disulfide bond isomerase DsbC, we adapted our HTP production pipeline for the expression of oxidized, functional venom peptides in the E. coli cytoplasm. The protocols are also applicable to the production of diverse disulfide-rich proteins. Here we demonstrate our pipeline applied to the production of animal venom proteins. With the protocols described herein it is likely that soluble disulfide-rich proteins will be obtained in as little as a week. Even from a small scale, there is the potential to use the purified proteins for validating the oxidation state by mass spectrometry, for characterization in pilot studies, or for sensitive micro-assays. Motivated by the advancement of genomics and accelerated rate of discovery of new proteins, high throughput pipelines have been developed to parallelize traditional approaches for the screening and identification of optimal protein production strategies. Potential variables to be optimized include, but are not limited to, varying expression strains1,2, temperature3,4, media2,3, target variants5, fusion partners6-13, co-expression with chaperones14,15, cytoplasmic or periplasmic expression16-18, and purification buffer components3. By implementing high throughput approaches, many variables or many targets can be tested in parallel with a high level of efficiency, while limiting batch-to-batch variation. In our experience, the strategy also gives good reproducibility upon scale-up using the same culture (temperature, media, aeration, etc.) and purification conditions (same resin, buffers, etc.). Several high throughput platforms have been used in the past decade to identify conditions for soluble protein expression, namely through varying parameters such as fusion partners, expression strains or temperature19-23. We recently used our high throughput screening approach for the expression of soluble disulfide-rich proteins11. The proteins selected were not only from venomous sources, but also included disulfide-rich enzyme inhibitors from a wide range of species including plants, pigs, cows and humans. The experiment compared the effects of 12 different fusion partners and three different expression strains on the solubility and folding of 28 disulfide-reticulated proteins. We demonstrated that using DsbC as a fusion partner for production in the strain BL21 (DE3) pLysS vastly outproduced (in both yield and number of soluble proteins obtained) any other combination of strain and fusion tested11. The results of this experiment formed the basis for adapting our original general high throughput pipeline (which has been used for the expression screening of a wide range of proteins)22,24 into one more suited for the expression of disulfide-rich targets. Disulfide-rich proteins from animal venoms are of particular interest. Venoms are a complex mixture of bioactive peptides and proteins, with potential value pharmacologically and therapeutically. However, expression of disulfide bond-containing proteins is not trivial. These proteins generally contain between one to seven disulfide bonds, and must be oxidized with the correct disulfide-bonding patterns in order to be active. Currently, the platform is being used for screening the expression of a large number of disulfide-rich animal venom proteins as part of the FP7 European VENOMICS Project (www.venomics.eu) and benchmarking novel protocols for the high throughput expression of thousands of targets. Here, an automated method is provided for high throughput small-scale expression screening and purification (see Figure 1) applied to disulfide-rich animal venom proteins. The strategy for disulfide rich peptides and proteins utilizes a HIS-tag for purification and the redox-active fusion partner, DsbC, creating cleavable HIS-DsbC fusions to the target proteins (see Figure 2). While the focus of the protocols herein is automation using a liquid handling robot and HTP electrophoresis, these methods are also suitable for a high throughput manual approach, meaning that even laboratories with a basic setup can take advantage of the protocols without any prerequisite for expensive equipment. Manual protocols for the transformation to purification and analysis (not specific to disulfide-rich proteins) have been published elsewhere24 and will not be repeated here. 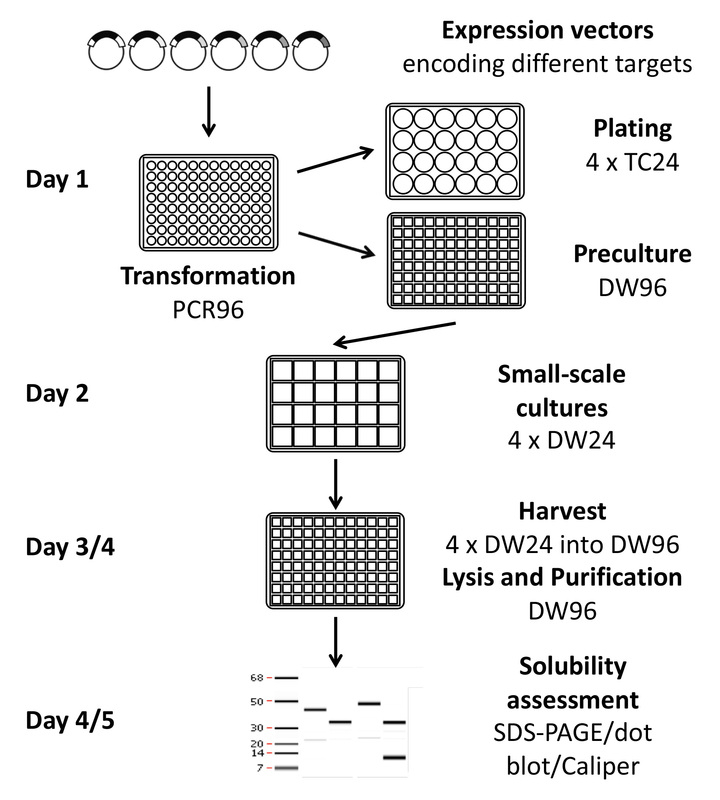 The throughput of the manual procedure (from expression clone, produced by recombinational cloning25, to analysis of soluble protein levels) is 96 (using SDS-PAGE detection) or 384 (4 x 96; using dot blot and SDS-PAGE26) cultures per week (see Figure 1). This can be increased if performed in a semi-automated way (using a liquid handling robot and dot blot26 or HTP electrophoresis, such as with a Caliper GXII LabChip system22 for analysis of results) to up to 1,152 (12 x 96) cultures in parallel over one week, as described herein. Culturing is performed in deep well 24 (DW24) format so that regular shaking incubators can be used in contrast to cultures grown in deep well 96 (DW96) format, which necessitate the use of short orbital high-speed shaking incubators for sufficient aeration (shaking at 800 rpm). The use of auto-induction media27 also simplifies expression, eliminating the manual induction step. Even where laboratories already use pre-defined expression and purification conditions, these can be transferred directly into this HTP system simply to improve efficiency. A detailed schematic of the high throughput screening pipeline for disulfide-rich proteins is provided in Figure 3. The parameters in the pipeline were selected based on extensive screening experiments11,22, which allowed us to choose the most useful conditions for protein production. Characterization can be performed on tagged proteins purified directly from small-scale expressions in pilot studies where tens of micrograms of sample is sufficient, or for sensitive functional assays and binding assays (for example, low volume HTP patch clamp systems28). The same can even be performed on the untagged targets after cleavage, provided the tag and protease are removed (for example, by reverse phase HPLC). Quality control can also be performed by mass spectrometry (to confirm the expected size and oxidation state) or chromatographic methods (to confirm purity or heterogeneity)29. Sometimes tag cleavage is unnecessary or even undesirable (particularly for poorly soluble proteins30,31), so in this protocol cleavage is optional. Regardless, in all constructs there is a TEV protease cleavage site (ENLYFQ/[G]32) directly preceding the target gene to produce native protein after cleavage (see Figure 2 and Discussion). If cleavage of the fusion tag is desired, cleavage can be tested (on the elution fraction or ‘on column’) at the small scale to analyze efficiency, optimize conditions if required and obtain reliable estimates of yields for subsequent scale-up experiments. There are two options for the volume of beads used during the affinity purification, depending on the aims and expectations of the experiment. To be able to capture as much protein as possible (to purify for pilot assays or MS, or to extrapolate for scale-up yields) a final volume of 200 µl of resin should be used, allowing detection of soluble protein in the range of 1-100 mg/L culture before saturation of the system (see protocol (A) in Section 8.1). However, if the aim of the experiment is the detection of low amounts of soluble proteins then a final volume of 50 µl of resin is suitable, allowing detection of soluble protein in the range of 0.1-25 mg/L culture (see protocol (B) in Section 8.2). Production can be scaled up, if required, to obtain milligram quantities of purified targets for further structural and functional studies using the conditions identified for soluble expression. The details of scale-up protocols used at AFMB have been discussed elsewhere22,24. Further details relevant to the experimental setup, critical steps within the protocol, modifications and trouble-shooting and limitations of the technique are provided in the discussion. Please read the discussion before commencing the experiments. Throughout the protocols we expect a success rate of 90% at each step (for example, at least 90% of the cultures must grow at any given step). If the success rate of any step in the experiment falls below 90% the samples are discarded and the experiment is repeated for the full collection of constructs. However, this success rate is not applicable to the number of constructs that express as soluble proteins or the proportion of constructs that cleave with 100% efficiency, as this will be highly dependent on the proteins tested. The specific details for the set-up of the robot worktable are provided for each protocol (also see Figure 4), however they can be adapted as required for alternative worktable set-ups. The robot hardware (Tecan) consists of a 96-multichannel arm (MCA96), robotic manipulator (RoMa) and the 8-channel liquid handling head (LiHa). All steps utilizing the MCA96 can also be performed using the LiHa if an MCA96 is not available, however they will take longer because the LiHa will need to be washed between steps. While the robot is technically not a sterile environment, the inclusion of antibiotics generally ensures that there are not problems with contamination or sterility. Manual procedures for cloning22 and transformation to purification are discussed elsewhere24. 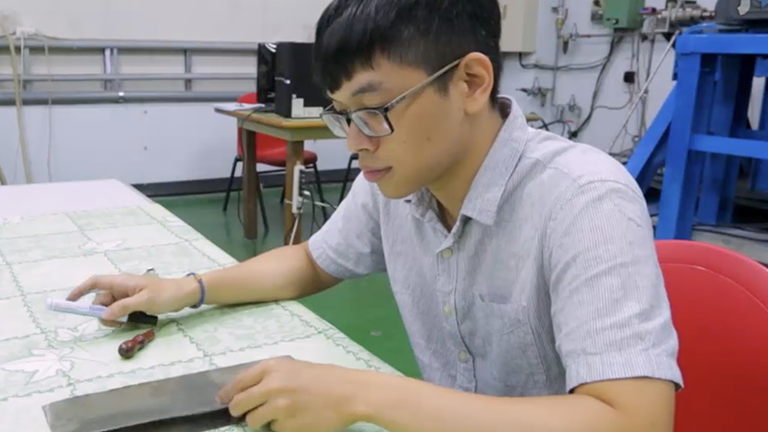 The transformation protocol can be fully performed on the robot26 but it is usually more time-efficient to do it manually. Therefore the protocols herein begin from inoculation of the expression precultures and plating of the transformation from the heat shocked transformation mixes done manually. For further details on the manual cloning and transformation procedures see the relevant references22,24. Put a 300 ml trough containing 150 ml sterile LB broth (supplemented with Ampicillin (100 µg/ml)/Chloramphenicol (34 µg/ml), or other appropriate antibiotic) at position 8. Put a sterile DW96 at position 11. Put 4x pre-prepared 24-well LB agar (Amp/Cam) tissue culture plates (containing 2 ml agar in each well) with their lids on in positions 14 to 17. Put the transformation plate (containing the 96 transformation mixes after heatshock) at position 13. This will be used to inoculate the liquid precultures and LB agar plates. Put a box of sterile 200 µl pipette tips at position 18. Using the 96-multichannel arm (MCA96) and 200 µl tips, aspirate 200 µl of LB broth (position 8), and dispense into the DW96 at position 11. Repeat until there is a final volume of 1 ml LB broth in each well of the DW96. This will become the liquid preculture. Using the robotic manipulator (RoMa), remove the lid of the first 24-well LB agar plate and place it elsewhere (for example in a hotel carrier) until the plating is finished for that plate. Using the 8-channel liquid handling (LiHa) head, mix then aspirate 50 µl of the first column of transformation mix at position 13. This volume of transformation mix is just enough to cover the LB-Agar well. With the first 4 channels, dispense onto the first column of the first 24-well LB agar plate at position 14 (as shown in Figure 5). With the last 4 channels, dispense onto the second column of the first 24-well LB agar plate. Wash all tips thoroughly after dispensing. Continue this process until all transformations have been plated on the first plate at position 14, transferring from 96- to 24-well using the scheme provided in Figure 5. Once the first plate has been completed, use the RoMa to replace the lid and remove the lid from the next plate at position 15. Continue using the plating scheme for the next 3 plates. Once plating is finished, set the Te-Shake to 1,200 rpm and shake all plates for 1 min to have a homogenous distribution of the transformation mix. Using the MCA96 and the original pipette tips, mix then aspirate 60 µl of the remaining transformation mix (position 13) and dispense into the DW96 containing LB broth at position 11. Seal the DW96 precultures with breathable adhesive film to allow culture aeration. Place in a 37 °C shaking incubator at maximum speed O/N (200/800 rpm depending on shaker orbital). The LB agar plates should be placed in a hood with their lids off until dry (10 min). Then they are placed inverted in a 37 °C plate incubator until the following morning. The next day, the preculture is used to inoculate the test expression in auto-induction medium and for preparation of glycerol stocks. Put the agar plates in a refrigerator, as a back up. If necessary, starting from the agar plates or the glycerol stocks, the test expression could be re-done by inoculating a fresh LB preculture directly. NOTE: This procedure takes approximately 5 min to complete for each set of 4x DW24 plates. Make up 500 ml ZYP-5052 auto-induction medium for each replicate of 96 cultures (464 ml ZY medium, 250 µl 2 M MgSO4, 10 ml 50x 5052, 25 ml 20x NPS, in that order – the recipes for each component are provided in Table 1) supplemented with the appropriate antibiotics. Put two 300 ml troughs, each containing ~250 ml medium at position 5 and 6. Put four sterile DW24 plates at positions 14 to 17. Put 200 µl tips at position 18. Using the MCA96 and 200 µl tips, aspirate 200 µl of ZYP-5052 from position 5 and dispense into the first DW24 plate at position 14. Do this a total of 5 times (4 tips will dispense into a single well at once for a total of 4 ml). Repeat for the remaining 3 x DW24 plates at positions 15 to 17, switching to the ZYP-5052 at position 6 for the last two DW24 plates. NOTE: Inoculation takes approximately 10 min to complete for each set of 4x DW24 plates, and growth continues O/N. Put the DW96 plate containing the precultures (from step 1.15) at position 11. Put the four DW24 plates containing ZYP-5052 medium (from step 2.3) at positions 14 to 17. Using the LiHa aspirate 100 µl of preculture from position 11 to inoculate the test expression cultures (1/40 dilution) using the scheme provided in Figure 5. Wash the LiHa head thoroughly at the wash station between each column of the 96-well precultures. Seal the DW24 plates with breathable film and incubate at 37 °C with shaking (200/400 rpm) for 4 hr. This is the time of the growth phase during which glucose from the medium will preferentially be depleted27. Reduce the temperature to 17 °C. After the 4 hr and depletion of glucose, lactose will start to be metabolized, leading to induction of expression, providing the optimal growth conditions for BL21 (DE3) pLysS or Rosetta 2 (DE3) pLysS, in this work22. Leave the cells to express O/N. Use the remaining preculture to make glycerol stocks. NOTE: Glycerol stocks should be made in triplicates to be stored in different locations in case of freezer failure. Put microtiter plates at position 5 to 7 to house the glycerol stocks. Put a 300 ml trough filled with 50 ml of 100% glycerol at position 8. Put a DW96 containing 800 µl of preculture (after step 3.2) in each well at position 11. Put 200 µl tips at position 18. Using a slow aspiration and dispensing speed, use the MCA96 and 200 µl tips to add glycerol into the DW96 containing the precultures. Aspirate 200 µl of glycerol (from position 8). Dispense 150 µl (at position 11) first, then pause for 20 sec to allow the remaining glycerol to reach the bottom of the tip. Dispense the remaining 50 µl. Using the same tips, mix the culture and glycerol in the DW96 at position 11 until they are thoroughly mixed. The final concentration of glycerol is 20%. Aspirate 140 µl from the DW96 and dispense into the first microtiter plate at position 5. Repeat step 4.3 for each remaining microtiter plate (positions 6 and 7). Seal each microtiter plate with plastic adhesive tape and store at -80 °C. Discard the remaining culture in the DW96, decontaminating with an antimicrobial agent before disposal. NOTE: It is not usually necessary to assess the final growth rate as the final OD600 is usually the same for most cultures (around 12 in these conditions), however any cultures that do not grow should be noted. Take 50 µl of each culture (from step 3.4) and dispense into a flat-bottomed, clear microtiter plate containing 150 µl of medium. Measure the OD600, taking into account the 4-fold dilution. If there are any that did not grow very well, note this for the final analysis. NOTE: This procedure takes approximately 45 min to complete. Centrifuge the 4x DW24 plates (from step 3.4) at 3,000 x g for 10 min then discard the supernatant into a waste container containing antimicrobial agent. Tap the plates, upside-down, onto absorbent paper to remove any excess medium. In the meantime, prepare 100 ml of lysis buffer (50 mM Tris, 300 mM NaCl, 10 mM imidazole pH 8, or other preferred buffer) containing lysozyme (final concentration 0.25 mg/ml). Put the lysis buffer in a 300 ml trough at position 5. Put a clean DW96 at position 11. Put the 4 x DW24 plates containing the cell pellets (from step 6.1) in positions 14-17. Put 200 µl tips at position 18. Using the MCA96 and 200 µl tips, aspirate 125 µl of lysis buffer from position 5 and dispense into each DW24 plate (positions 14-17). Repeat. NOTE: 4 tips will dispense into a single well at once for a final volume of 1 ml in each well of the DW24 plates. Shake the plates at positions 14-17 using the Te-Shake (1,000 rpm) for 15 min to resuspend the pellets. Once the pellets are resuspended, use the first 4 channels of the LiHa to aspirate 550 µl from samples 1 to 4 (the first column of the first DW24, at position 14), then using the last 4 channels of the LiHa aspirate 550 µl of samples 5 to 8 (the second column of the first DW24). Dispense into the first row of the DW96 at position 11. Repeat step 6.6, so that all of the cell suspension is transferred to the DW96. After each set of samples wash the LiHa tips in the wash station. 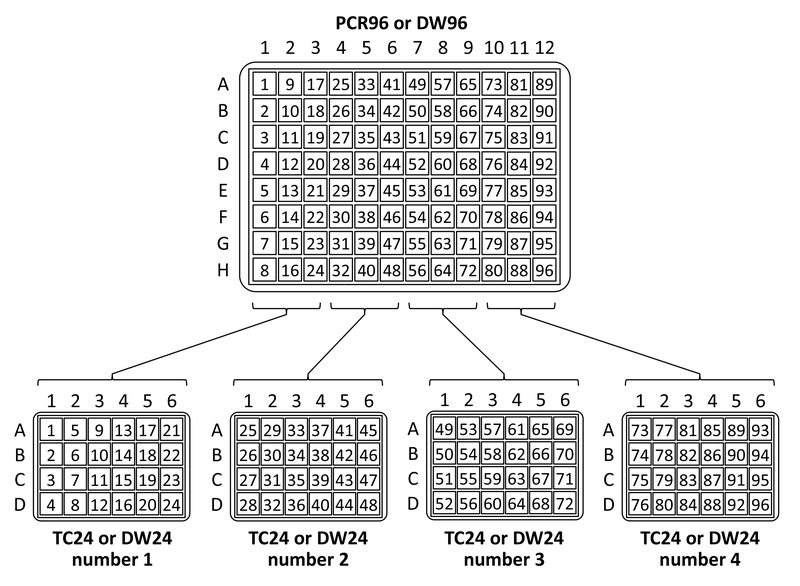 Repeat steps 6.6 to 6.8 for each column in each DW24 plate (positions 15-17) using the scheme provided in Figure 5. Seal with plastic film. For purification on the same day or short-term freezing, store at -80 °C for a minimum of 1 hr, otherwise store at -20 °C. NOTE: This procedure takes around 60 min to complete. Thaw the frozen cell suspensions (from step 6.10) in a water bath (at RT or 37 °C) for approximately 15 min and resuspend in the shaking incubator for an additional 10 min. The cultures should become viscous. Take 500 µl of DNase stock and mix it with 1 ml of MgSO4 stock. Manually with an 8-channel pipette or with the robot LiHa, dispense 15 µl into each well of the DW96, to give a final concentration of 10 µg/ml of DNase and 20 mM MgSO4. Re-seal the plate with plastic tape and shake for a further 15 min. At this point the cultures should be non-viscous. Check carefully (by visual examination) that all the cultures are no longer viscous. NOTE: This is critical, if some cultures are still viscous (for example, if the DNase was accidentally forgotten or not dispensed appropriately in some wells), the filter will clog, generating an uneven pressure on the samples and overflow or total clogging of the filter plate could happen during the purification. For SDS-PAGE samples of the whole cell lysate, aspirate 10 µl of lysate and dispense into a 96-well PCR plate containing 10 µl of 4x SDS-PAGE sample buffer and 20 µl of water. Denature for 3 min at 95 °C and freeze until analysis (Total fraction). If a HTP electrophoresis system is available, the samples can be analyzed on this instead following the Manufacturer’s recommended protocol for sample preparation. For further details regarding analysis of the samples see Section 10. NOTE: A slow aspiration speed should be used for pipetting all resin suspensions, as the suspensions are quite thick. Over-drying the resin will result in a reduction in binding capacity. For purification, the specified imidazole concentrations are applicable to nickel affinity resin. If alternative ions (e.g., cobalt) are used, then the concentrations should be adjusted accordingly. NOTE: This purification procedure takes around 1.5 hr to complete, meaning that up to 4 can be performed in one day. Put 300 ml troughs containing binding buffer (50 mM Tris, 300 mM NaCl, 10 mM imidazole pH 8), wash buffer (50 mM Tris, 300 mM NaCl, 50 mM imidazole pH 8) and elution buffer (50 mM Tris, 300 mM NaCl, 250 mM imidazole pH 8) in positions 6 to 8, respectively. Leave an empty 300 ml trough at position 5 for the resin slurry. At position 9 and 10 put plate holders. At position 10 put a DW96 with the SPE block and filter/receiver plate (20 µm) on top. Put the DW96 containing the lysate (from step 7.3) at position 14. At position 18 and 19 put the 200 µl wide bore tips and 200 µl tips, respectively. Put two spare DW96 plates for the wash and elution in a hotel. NOTE: They could also be put at an alternative site on the worktable if a hotel is unavailable. Prepare 105 ml of equilibrated 33% resin slurry (35 ml resin + 70 ml binding buffer). Add the resin suspension to the trough at position 5 immediately before beginning the procedure. Using the MCA96 and 200 µl wide bore tips (position 18), mix the resin slurry at position 5 thoroughly before aspirating and dispensing 200 µl of resin slurry into the DW96 containing the lysate at position 14. Repeat twice so that 600 µl of resin slurry has been added to the lysate, mixing the resin suspension before each aspiration. Perform a 10 min mixing step using the MCA96 at position 14 to allow for binding and to prevent the resin from pelleting. Aspirate from position 14 and dispense 800 µl (in 200 µl lots) onto the filter plate at position 9, mixing before each aspiration otherwise the resin will be retained at the bottom of the DW96. Turn the vacuum on at position 10 for approximately 90 sec to filter the lysate through the plate into the DW96 to collect the flow-through, taking care not to dry out the resin. Turn the vacuum off. Repeat steps 8.1.5 and 8.1.6 so that all of the resin is then in the filter plate. Using the RoMa arm move the SPE block holding the filter plate from position 10 to position 9 so that the next wash step goes directly to the waste and transfer the DW96 containing the flow-through at position 10 to another site (e.g., into a hotel carrier) until the end of the procedure. With a new set of 200 µl tips (at position 19), wash the resin (at position 9) with a total of 800 µl of binding buffer (from position 6), and apply the vacuum at position 9 until the buffer has passed through. Repeat once more. Use the RoMa arm to place a fresh DW96 at position 10 to collect the 50 mM imidazole wash and move the SPE block and filter plate back on top (position 10). Add 800 µl of wash buffer from position 7 onto position 10, turn the vacuum on until the buffer has passed through. Switch the vacuum off. With the ROMA, remove the SPE block and filter plate to position 9 and the DW96 containing the wash sample to the hotel, and keep it aside until the end of the procedure. Wash the resin with another 800 µl of wash buffer (from position 7 onto position 9), apply the vacuum until the buffer has passed through. Repeat once more. Use the RoMa to place a fresh DW96 at position 10 and place the SPE block and filter plate back on top to collect the elution. Add a total of 500 µl of elution buffer (from position 8 onto position 9) and incubate in situ for 3 min. Turn on the vacuum until all buffer has passed through. Optional: For highly expressing proteins, a second elution can be performed into a fresh DW96 as in steps 8.1.14 and 8.1.15. Take samples of the flow-through, wash and elution/s for SDS-PAGE or HTP electrophoresis. For SDS-PAGE samples of the flow-through, dispense 10 µl into a 96-well PCR plate containing 10 µl of 4X SDS-PAGE sample buffer and 20 µl of water. For SDS-PAGE samples of the wash and elution/s dispense 30 µl into PCR plates containing 10 µl of 4x SDS-PAGE sample buffer. Denature for 3 min at 95 °C and freeze until analysis. For HTP electrophoresis samples, follow the manufacturer’s instructions. For further details regarding analysis of the samples see Section 10. NOTE: This purification procedure takes around 30 min to complete, meaning that up to 12 can be performed in one day. Put the DW96 containing the lysate (from step 7.3) at position 14. At position 18 and 19 put 200 µl wide bore tips and 200 µl tips, respectively. Put a spare 96-well microtiter plate for the elution in a hotel. NOTE: This could also be put at an alternative site on the worktable if a hotel is unavailable. Prepare 50 ml of equilibrated 25% resin slurry (12.5 ml resin + 37.5 ml binding buffer). Add the resin suspension to the trough at position 5 immediately before beginning the procedure. Using the MCA96 and 200 µl wide bore tips (position 18), mix the resin slurry at position 5 thoroughly before aspirating and dispensing 200 µl of resin slurry into the DW96 containing the lysate at position 14. Incubate at RT with shaking using the Te-Shake at 1400 rpm for 10 min to allow binding. Aspirate from position 14 and dispense the full 1,200 µl (in 200 µl lots) using the wide bore tips (position 18) onto the filter plate at position 10. Mix before each aspiration otherwise the resin will be retained at the bottom of the DW96. Turn the vacuum on at position 10 for approximately 30 sec to filter the lysate through the plate into the DW96 to collect the flow-through, taking care not to dry out the resin. Turn the vacuum off. Using the RoMa arm, move the SPE block holding the filter plate from position 10 to position 9 so that the next wash step goes directly to the waste and transfer the DW96 containing the flow-through at position 10 to another site (e.g., into a hotel carrier) until the end of the procedure. With the 200 µl tips (at position 19), wash the resin (at position 9) with a total of 800 µl of binding buffer (from position 6), and apply the vacuum at position 9 until the buffer has passed through. Repeat. Use the RoMa arm to place the fresh DW96 at position 10 to collect the 50 mM imidazole wash and move the SPE block and filter plate back on top (position 10). Add 150 µl of wash buffer from position 7 onto position 10, turn the vacuum on until the buffer has passed through. Switch the vacuum off. With the ROMA remove the SPE block and filter plate to position 9 and the DW96 containing the wash sample to the hotel, and keep it aside until the end of the procedure. Wash the resin with another 800 µl of wash buffer (from position 7 onto position 9), apply the vacuum until the buffer has passed through. Repeat. Use the RoMa to place the microplate at position 9 and place the SPE block and filter plate back on top to collect the elution. Add 190 µl of elution buffer (from position 8 onto position 9) and incubate in situ for 3 min. Apply the vacuum until all buffer has passed through. Take samples of the flow-through, wash and elution for SDS-PAGE or HTP electrophoresis. Add the TEV protease (2 mg/ml) to the eluted protein (from step 8.1.15 (and 8.1.16) or step 8.2.14) in a ratio of 1/10 (v/v). Incubate at RT (or 4 °C for temperature-sensitive proteins) O/N with gentle shaking. At the end of cleavage dispense 30 µl into a PCR plate containing 10 µl of 4x SDS-PAGE sample buffer or follow the Manufacturer’s instructions for HTP electrophoresis samples. Filter the remaining cleavage mixture (from step 9.2) through a 96-well 0.22 µm filter plate and collect the soluble flow-through in a DW96 by applying the vacuum. This can be done at one of the vacuum sites (e.g., position 10) on the liquid handling robot, like for the elution steps in Sections 8.1 and 8.2. This removes any protein that precipitated during cleavage. After filtration, dispense 30 µl into a PCR plate containing 10 µl of 4x SDS-PAGE sample buffer or prepare as HTP electrophoresis samples. This allows the comparison of the protein before cleavage, the mixture after cleavage and the soluble protein remaining after cleavage and gives good indications of the expected results in subsequent scale-up experiments. For further details regarding analysis of the samples see Section 10. Identify the constructs expressing soluble protein by analyzing the purification samples on SDS-PAGE, dot blot or HTP electrophoresis system such as the Caliper LabChip. Analyze the elution samples first to identify constructs producing soluble protein. In most cases only the elution samples are analyzed if soluble constructs are identified, to minimize the time spent on the analysis. If the protein is not in the elution, run the wash and flow-through samples to see if it was expressed and did not bind properly to the resin. For constructs where no soluble protein can be detected run the whole cell lysate to see if the protein was expressed. NOTE: One limitation here is that if the protein of interest is not present above background expression levels, it may not be possible to see the protein and could lead to a false negative. It must be noted that it is always possible for proteins to stick and precipitate on the affinity resin and this could lead to a false negative or under-estimation of the yield using the recommended protocol (a rare event in this work). In the event that the protein precipitates upon elution (a white pellet is visible a few minutes/hours after elution) it is recommended to change the buffer composition (for example, salt concentration) and/or perform a differential scanning fluorimetry assay to optimize the buffers. A small sample of the resin can also be resuspended in SDS-PAGE sample buffer and boiled to detect if a protein is being retained on the resin. If the protein was not expressed but the cells did grow, pursue a new expression strategy, or if the OD600 was not high enough regrow and reanalyze the culture. If cleavage samples are to be analyzed, they should be analyzed in a side-by-side manner, so that each construct can be shown before cleavage an after cleavage in adjacent lanes, to simplify the analysis. Unless using a method that gives direct quantification of the elution concentration, quantification should be performed for positive samples by measuring the absorbance at 280 nm (A280). Measure the A280, taking the extinction co-efficient of the protein into account and using the elution buffer as a blank, to provide an estimate of protein yield in order to identify the highest expressing soluble constructs. For the most reliable comparison of soluble yields, it is recommended to normalize the yields by the density of the culture (using the OD600 measurement), which was taken at Section 5. If all cultures grew to approximately the same density, normalization is not required. Samples can be analyzed directly from the elution or cleavage sample by liquid chromatography–mass spectrometry (LC/MS). Alternatively, desalt first (to remove imidazole and any buffer salts that may be present) using ZipTip pipette tips or liquid chromatography methods, then analyze using matrix-assisted laser desorption/ionization time-of-flight (MALDI-TOF) or electrospray ionization (ESI) mass spectrometry. Small-scale functional studies can be performed to check if the function of the protein is as expected. If larger amounts are required for function, a scale-up culture can be made and the function tested from the larger culture once size and oxidation state have been confirmed at the small scale. 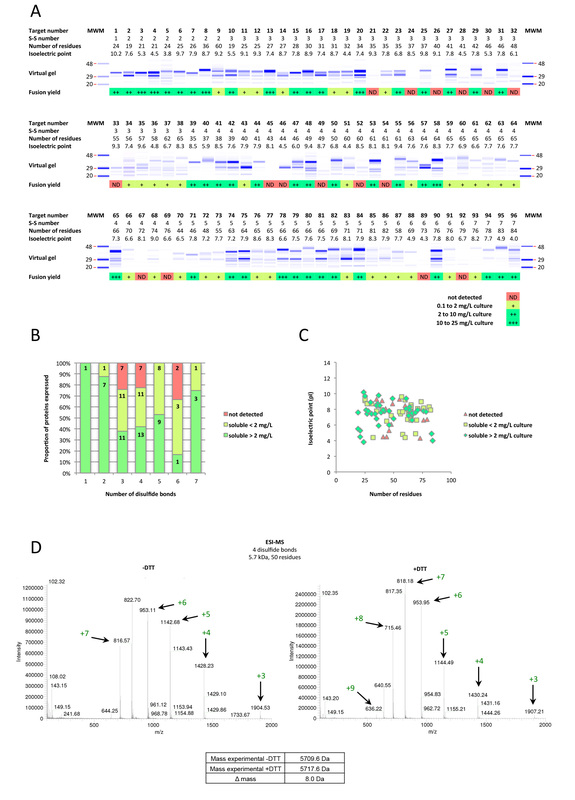 Representative results are shown in Figure 6 for the expression screening of 96 disulfide-rich proteins from the VENOMICS pipeline. The proteins are arranged by increasing number of disulfide bonds then increasing number of residues. The peptides were expressed in the cytoplasm with a HIS-tag and DsbC fusion partner. When using the recommended culture conditions, an OD600 of 12 is normally achieved. The peptides were purified using protocol 8.2-B with a final volume of 50 µl of nickel affinity resin, so a maximum of ~25 mg/L fusion protein could be detected in this experiment. Figure 6A shows the electrophoresis result from the Caliper LabChip system (showing the fusion before cleavage) and the scoring system based on extrapolation to yield in mg/L culture of the fusion protein (in levels of 0.1 to 2 mg/L culture, 2 to 10 mg/L culture, 10 to 25 mg/L culture and not detected.) Note that the cleaved DsbC tag normally runs at around 32 kDa, rather than 27 kDa as expected. Similarly, the DsbC fusions also run around 5 kDa higher than expected. For a lot of the targets we not only see the intact fusion (upper band), but also the fusion partner alone (lower band). For some of these targets optimizing the culture conditions can improve the ratio of the intact fusion (upper band) compared to DsbC alone allowing an increase of the final yield. The scoring is based only on the level of intact fusion. Only 16 out of 96 proteins could not be detected at the fusion level. This corresponds to an overall success level of 83%. Of the 80 proteins that could be detected, 45 of these were detected at levels greater than 2 mg/L culture (56%). Depending on target and fusion, protein yields are usually in the range of 2-100 mg/L culture (although in this example using the protocol 8.2 B a maximum of ~25 mg/L fusion protein can be detected). An analysis of the success by number of disulfide bonds present (shown in Figure 6B) shows reasonable success for all numbers of disulfide bonds tested (between 1 and 7), with the lowest success level being 66% for targets containing 6 disulfide bonds. An analysis of the distribution of expression success based on isoelectric point and number of residues (shown in Figure 6C) shows no particular bias for the technique, with both successfully expressed targets and targets that were not detected scattered throughout the plot. Figure 6D shows an example of the mass spectrometry results obtained from electrospray ionization mass spectrometry (ESI-MS) for a single target, before and after reduction of the sample with DTT. Normally, such an exhaustive mass spectrometry analysis would not need to be performed (a reduced sample would not need to be analyzed), however for the purposes of thorough demonstration we have shown both results. The target shown is a 5.7 kDa disulfide-rich venom protein with 4 disulfide bonds. The spectrum on the left shows the results for the protein prior to reduction with DTT, as it was after cleavage and desalting without further intervention. The spectrum on the right hand side shows the protein after reduction with DTT followed by desalting to remove any excess DTT. The ions corresponding to the experimental masses are marked with arrows on the spectrum and the designation for each ion is shown in green. The experimental parent masses calculated for these ions (for the protein prior to reduction (-DTT) and after reduction (+DTT)) are shown in the table. The masses (5709.6 Da for the sample prior to reduction and 5717.6 Da for the reduced sample) exhibit a mass difference of 8 Da. A mass difference of 2 Da corresponds to the presence of 1 oxidized disulfide bond, therefore a mass difference of 8 Da indicates the presence of 4 disulfide bonds (as expected) in the non-reduced sample. Figure 1. Schematic representation of the high throughput expression screening protocol. Using this protocol, 96 to 384 conditions can be tested by a single person in one week using manual methods, or up to 1,152 conditions with the described semi-automated equipment. Expression plasmids are constructed using a recombination cloning technology so that numerous targets can be sub-cloned at one time. Once soluble expression conditions have been identified and cleavage performed, if desired, the protein can proceed to quality control to check oxidation and purity, microassays and/or large-scale production. Figure 2. Schematic for universal recombinational cloning and construct design. From the target entry clones, multiple expression vectors can be sub-cloned in a single experiment in a high throughput fashion (up to 6 x 96 entry clones in a week). The expressed protein encodes a HIS tag for nickel affinity purification. The DsbC (lacking its periplasmic signal sequence for cytoplasmic expression) fusion partner is used to increase solubility and/or aid folding and correct oxidation of the target protein. Note that the target coding sequence should contain an N-terminal TEV protease site (ENLYFQ) if tag cleavage is desired. The inset at the top left shows the production of the entry clones using a donor vector and the target sequences, which can be obtained by PCR or gene synthesis. Entry clones can also be obtained from commercial entry clone collections. Multiple recombinational cloning systems are available, however we utilize the Gateway system, as shown in the schematic. Figure 3. High throughput screening pipeline for multiple disulfide-rich targets. Targets are initially expressed as HIS-DsbC fusions in the cytoplasm of BL21 (DE3) pLysS E. coli at 37/17 °C using auto-induction medium (ZYP-5052). Purification is performed on nickel resin followed by detection of soluble constructs by HTP electrophoresis (or with dot blot/SDS-PAGE). If the first round of expression screening is unsuccessful, alternative culture conditions are tried. If constructs produce soluble proteins in high enough yields, microassays and quality control can be performed and, if required, large-scale production can be pursued. For targets where soluble yields are not high enough, expression screening can continue with alternative strains and temperatures then other fusion partners and periplasmic expression. Optional steps are indicated by dashed boxes. Figure 4. Robot Worktable setup for the HTP platform. The layout of our liquid handling robot worktable is shown, although alternative worktables can also be used provided there are equivalent sites available. The setup consists of a wash station (WS) for the (8-channel liquid handling head (LiHa)), two microplate carriers with 4 positions each (MP4, positions 1-4 and 5-8), a vacuum station with 2 positions (Te-VacS, positions 9 and 10), a microplate carrier with 3 positions (MP3, positions 11-13), two plate shakers with 2 positions each (Te-Shakers, positions 14-15 and 16-17) and a carrier for disposable tips with 3 positions (DiTi, positions 18-20). In addition there are two hotel carriers for deep well plates and one for microplates (not shown). The hardware installed on the liquid handling robot is a 96-multichannel arm (MCA96) for use with disposable tips, an 8-channel liquid handling head (LiHa) with fixed tips and a robotic manipulator (RoMa) that moves plates/equipment around on the worktable. The numbering of the positions is referred to throughout the protocol. Figure 5. Schematic for transferring from a single 96-well plate into four 24-well plates. Figure 6. Representative results are shown for the expression screen of 96 disulfide-rich venom proteins. The proteins were expressed as HIS-DsbC fusions in the cytoplasm and purified using 50 µl of Nickel resin (Protocol 8.2-B). A) Expression screening results, showing virtual gel and scoring for the expression yield. The contrast in the virtual gel has been adjusted lane-to-lane to compensate for very faint or intense bands. Note that for some targets two bands can be seen, the upper band corresponding to the intact fusion protein and the lower band corresponding to the fusion tag alone. B) The proportion of proteins expressed at each expression level compared to the number of disulfide bonds in the protein. The actual number of proteins in each group is overlayed on the graph. C) The distribution of expression levels based on isoelectric point (pI) and number of residues. D) An example of the mass spectrometry results for a 5.7 kDa disulfide-rich venom protein with 4 disulfide bonds. The spectrum on the left hand side shows the protein prior to reduction with DTT and the spectrum on the right hand side shows the protein reduced with DTT and then desalted. The ions corresponding to the experimental masses are marked with arrows and their assignments are shown in green. The experimental masses for the protein prior to reduction and after reduction are shown in the table and exhibit a mass difference of 8 Da, corresponding to the presence of oxidized protein before addition of reducing agent. Please click here to view a larger version of this figure. 925 ml water Mix and then autoclave to sterilize. ~60 ml water Stir until dissolved then autoclave to sterilize. 100 g α-lactose Add in sequence, stir over heat until all dissolved then autoclave to sterilize. 142 g Na2HPO4 Add in sequence and stir until all dissolved then autoclave to sterilize. Table 1. Recipe for components of ZYP-5052 medium. There is no single universal protocol for the expression of soluble, folded, functional proteins. To be cost- and time-efficient, most laboratories or protein core facilities working with multiple targets therefore use high throughput protein expression screening to find the best ‘generic’ combination of variables to obtain a soluble active protein for the majority of targets. We have identified DsbC as being a generally applicable fusion partner for the soluble expression of disulfide-rich peptides and proteins11. Using DsbC fusions and high throughput methods, within a week the soluble expression of multiple targets can be observed11 and then additional variables, such as those discussed in the introduction, can be screened in subsequent rounds on those targets that require further optimization. The protocols described herein are aimed at the expression of disulfide-rich proteins and peptides. However, for users wishing to express non-reticulated proteins in a high throughput manner, the corresponding protocols have been published previously and can be found elsewhere22,24. The high throughput setup is ideal for a number of applications, including the screening of a large number of different proteins for soluble expression or the screening of a large number of expression constructs (including various fusion tags) for several target genes at the same time (or multiple expression constructs for a single target) in order to improve success rates. The platform can also be used for the benchmarking and validation of new protocols on a large number of targets. Other applications include the screening of variants for a single difficult target, e.g., all orthologs or members of the same family, or to test the success of production of a panel of mutants of a single target in one experiment. This protocol has also been used in combination with co-expression vectors (with one tagged protein only) to allow the pull down and preliminary characterization of protein-protein complexes followed by more thorough biophysical analysis to confirm the correct complex formation and stoichiometry33. The amount of protein purified is sometimes suitable for micro-assays (functional tests, protein-DNA34 or protein-protein interaction assays). There are several advantages to the high throughput expression screening strategy: (i) the ability to test a large number of targets or a large number of variables in a single experiment, (ii) limited batch-to-batch variation, (iii) the simplicity and ease of working at a smaller-scale using deep-wells, (iv) scalability and reproducibility at larger scale, (v) the potential for automation, and(vi) simplicity of tracking and handling (no labeling of individual tubes, less mistakes introduced when using the plate format than with the handling of individual tubes in the mixing or exchanging of clones). Although not discussed in the protocol section, there are several important considerations for the preparation of the experiment that will be briefly discussed below. For a more thorough discussion please see our previous publication24.For maximum efficiency, it is beneficial to have a suitable system for high throughput cloning, to simplify the sub-cloning of large numbers of targets. For the initial phase of the VENOMICS project, we utilize the versatile Gateway recombination system25 that allows subcloning in any destination vector at a pace of hundreds of clones per week. Protocols for Gateway recombination cloning can be found on the Invitrogen website. Other alternatives for high throughput cloning include ligation-independent cloning (LIC)35,36 and restriction-free (RF) cloning37.There are multiple ways to obtain the target genes for expression, including by PCR from template DNA, from entry clone collections or as synthetic genes, which is the strategy chosen for the VENOMICS project. Synthetic genes can be ordered with recombination sites on each end of the gene and gene synthesis allows easy codon optimization of the target gene sequence (to exclude rare E. coli codons). This is recommended but not essential. For targets without codon optimization that contain a high number of rare codons, Rosetta 2 (DE3) pLysS (which carries tRNAs for rare codons that are not highly expressed in E. coli) may be better suited than BL21 (DE3) pLysS. While there are strains available that limit the reduction of disulfide bonds in the normally reducing environment of the cytoplasm, in our hands they have not been as successful as regular E. coli strains11. Analytical scale affinity purification is performed from the test expression cultures in order to recover the soluble fusion proteins and quantify yields. Quantitative data can be obtained on the soluble yields of fusion proteins expressed within a range of 0.1 – 100 mg/L of culture. If a target is not soluble, alternative expression and induction temperatures, strains or media can be tested before different fusion partners are pursued. For soluble expression of disulfide-rich proteins, we previously ranked the effect of fusion partners as DsbC > DsbA > GST > MBP > TRX > HIS-tag for cytoplasmic expression11. Periplasmic expression is another possibility that may aid the successful folding of disulfide-rich targets. The periplasm is a less reducing environment than the cytoplasm and contains useful redox chaperones to assist disulfide bonding. DsbC, DsbA, and MBP proteins are normally localized to the periplasm by their periplasmic signal sequences. This provides the opportunity to exploit these tags to direct the disulfide-rich targets to the periplasmic space in order to assist folding. For intractable targets, the next step would be to purify the insoluble HIS-tagged target from inclusion bodies, solubilize and refold (this is out of the scope of this protocol and will not be discussed here39). This can be fairly simple for targets with only one or two disulfide bonds, but becomes increasingly more difficult as the number of disulfide bonds increases. Alternatively, and particularly for proteins and peptides with four or more disulfide bonds, it may be beneficial to try more complex production systems such as yeast, insect or mammalian expression. With advances in miniaturization and automation, HTP electrophysiology lab-on-a-chip technologies28 will undoubtedly be the way of the future for functional analyses. We envisage that for most purposes (perhaps with the exception of structural studies) this will negate the need for large scale cultures. Small scale cultures will not only be useful for screening expression conditions, but also be able to provide sufficient amounts of sample for these miniaturized functional assays. The ability to produce multiple targets in parallel in sufficient quantities for functional characterization will lower the costs of culturing and using these kind of platforms, expression and characterization of recombinant proteins will become more cost and time-effective. The protocols herein have been applied to the expression of disulfide-rich peptides and proteins in the initial phase of the FP7 European VENOMICS project. Venoms are an excellent source of bioactive peptides that often have interesting pharmacological potential. However, their production is challenging due to their complex disulfide-bonding patterns and small size. Using high-throughput platforms like the one described herein, the VENOMICS project aims to generate a library of 10,000 novel venom peptides to reproduce the diversity observed in nature. This library will be exploited for the characterization of disulfide-rich peptides with potential pharmacological or therapeutic applications with the aim of developing new drugs. The platform is currently being used for benchmarking and validating new protocols for use in the VENOMICS project. This work was supported by the French Infrastructure for Integrated Structural Biology (FRISBI) ANR-10-INSB-05-01. The authors would also like to thank Mr. Jeremy Turchetto for assisting with preparations for the shooting of the video. Tecan Freedom EVO 200 liquid handling robot Tecan Group Ltd. Protocols can be adapted to any liquid handling robot with a vacuum manifold for plates. LB medium Autoclaved for sterility. Antibiotic stocks Kanamycin (50 mg/ml), ampicillin (100 mg/ml), chloramphenicol (34 mg/ml in ethanol), store stocks at −20 °C. Use a 1:1,000 dilution. Deep-well 96 (DW96) plate with 2.42 ml volume capacity Greiner Bio-One 780270 Autoclaved for sterility. Expression vectors For the expression of target constructs. Store at −20 °C. BL21 (DE3) pLysS competent cells Or alternative E. coli expression strain of the user's choice. Store at −80 °C. PCR machine with 96-well plate block For the transformation heat shock and boiling of SDS-PAGE/Caliper samples. Multitron shaking incubator, with 3 mm throw Infors AJ103 Not essential, a regular shaking incubator can also be used. Microtiter plate For glycerol stocks and elution using purification protocol B.
Glycerol For the preparation of glycerol stocks. Bactinyl Orapi Group Or equivalent microbial disinfectant. ZYP-5052 medium See Table 1 for recipes of components. Deep well 24 (DW24) plates, 10 ml capacity Whatman 7701-5102 Autoclaved for sterility. Flat-bottomed, clear microtiter plate Greiner Bio-One 655101 For absorbance readings. Plate reading spectrophotometer Optional. For measuring OD600 of cultures. Centrifuge with rotor for deep well plates Suitable for 3,800 x g.
Lysozyme 50 mg/ml in water. Store at −20 °C. Imidazole ACS grade Merck IX0005-1 A high quality grade of imidazole must be used so that it will not interfere with A280 readings for calculating protein yield. Lysis buffer 50 mM Tris, 300 mM NaCl, 10 mM imidazole pH 8 containing 0.25 mg/ml lysozyme (or your preferred buffer). Add lyzozyme from stocks each time and do not store for extended periods. Plate sonicator (Ultrasonic processor XL, adapted for deep well plates) Misonix Inc. Not essential. Lysozyme alone is normally sufficient for nearly complete lysis. DNase 2 mg/ml stock in water, filter sterilized. Store aliquots at −20 °C. Magnesium sulphate (MgSO4) 2 M stock in water, autoclaved. Binding buffer 50 mM Tris, 300 mM NaCl, 10 mM imidazole pH 8 (or your preferred buffer). Store at 4 °C. Wash buffer 50 mM Tris, 300 mM NaCl, 50 mM imidazole pH 8 (or your preferred buffer). Store at 4 °C. Elution buffer 50 mM Tris, 300 mM NaCl, 250 mM imidazole pH 8 (or your preferred buffer). Store at 4 °C. Ni Sepharose 6 Fast Flow resin GE Healthcare 17-5318-02 For purification of target fusion proteins. Store at 4 °C. Wash and equilibrate before use. Tobacco Etch Virus (TEV) protease Optional, for cleavage. 2 mg/ml, without reducing agents in storage buffer. Store at −80 °C. 96-well 0.22 µm filter plate Millipore MSGV N22 10 Optional. To filter the soluble fraction after cleavage. SDS-PAGE/dot blot equipment or Caliper Labchip GXII equipment Electrophoresis apparatus and choice of gel type is at the user’s discretion. Spectrophotometer and cuvettes For measuring absorbance at 280 nm (A280) to calculate yield of soluble proteins. Not required if the analysis is done on the Caliper. ZipTip pipette tips Millipore Optional. The type of ZipTip is at the user's discretion. C4 resin should be used for larger proteins, while for peptides C18 may be better. Alternative methods for desalting of samples may also be used to clean up samples before further quality control. Materials are listed in the order in which they are required in the Protocol section. Reagents can be stored at room temperature unless noted otherwise. Reference numbers for the author’s preferred choice of materials are provided, however equivalent products may also be suitable. For reagents where the brand will not influence the outcome of the experiment, the company details have been omitted. Berrow, N. S., et al. Recombinant protein expression and solubility screening in Escherichia coli: a comparative study. Acta Crystallographica Section D-Biological Crystallography. 62, 1218-1226 (2006). Correa, A., Oppezzo, P. Tuning different expression parameters to achieve soluble recombinant proteins in E. coli: advantages of high-throughput screening. Biotechnol J. 6, 715-730 (2011). Graslund, S., et al. Protein production and purification. Nat Methods. 5, 135-146 (2008). Vera, A., Gonzalez-Montalban, N., Aris, A., Villaverde, A. The conformational quality of insoluble recombinant proteins is enhanced at low growth temperatures. Biotechnol Bioeng. 96, 1101-1106 (2007). Graslund, S., et al. The use of systematic N- and C-terminal deletions to promote production and structural studies of recombinant proteins. Protein Expr Purif. 58, 210-221 (2008). Bird, L. E. High throughput construction and small scale expression screening of multi-tag vectors in Escherichia coli. Methods. 55, 29-37 (2011). Davis, G. D., Elisee, C., Newham, D. M., Harrison, R. G. New fusion protein systems designed to give soluble expression in Escherichia coli. Biotechnol Bioeng. 65, 382-388 (1999). Kapust, R. B., Waugh, D. S. Escherichia coli maltose-binding protein is uncommonly effective at promoting the solubility of polypeptides to which it is fused. Protein science: a publication of the Protein Society. 8, 1668-1674 (1999). LaVallie, E. R., Lu, Z., Diblasio-Smith, E. A., Collins-Racie, L. A., McCoy, J. M. Thioredoxin as a fusion partner for production of soluble recombinant proteins in Escherichia coli. Methods Enzymol. 326, 322-340 (2000). Marblestone, J. G., et al. Comparison of SUMO fusion technology with traditional gene fusion systems: enhanced expression and solubility with SUMO. Protein science: a publication of the Protein Society. 15, 182-189 (2006). Nozach, H., et al. High throughput screening identifies disulfide isomerase DsbC as a very efficient partner for recombinant expression of small disulfide-rich proteins in E. coli. Microb Cell Fact. 12, 37 (2013). Sachdev, D., Chirgwin, J. M. Fusions to maltose-binding protein: control of folding and solubility in protein purification. Methods Enzymol. 326, 312-321 (2000). Smith, D. B. Generating fusions to glutathione S-transferase for protein studies. Methods Enzymol. 326, 254-270 (2000). de Marco, A., Deuerling, E., Mogk, A., Tomoyasu, T., Bukau, B. Chaperone-based procedure to increase yields of soluble recombinant proteins produced in E. coli. BMC Biotechnol. 7, 32 (2007). Hatahet, F., Nguyen, V. D., Salo, K. E., Ruddock, L. W. Disruption of reducing pathways is not essential for efficient disulfide bond formation in the cytoplasm of E. coli. Microb Cell Fact. 9, 67 (2010). de Marco, A. Recent contributions in the field of the recombinant expression of disulfide bonded proteins in bacteria. Microb Cell Fact. 11, 129 (2012). Katzen, F., Beckwith, J. Disulfide bond formation in periplasm of Escherichia coli. Methods Enzymol. 348, 54-66 (2002). Klint, J. K., et al. Production of recombinant disulfide-rich venom peptides for structural and functional analysis via expression in the periplasm of E. coli. PloS One. 8, e63865 (2013). Braud, S., et al. Dual expression system suitable for high-throughput fluorescence-based screening and production of soluble proteins. Journal of Proteome Research. 4, 2137-2147 (2005). Douzi, B. G. A., et al. A new system for expressing recombinant animal toxins in E. coli. (Collection Rencontres en Toxicologie, Publications de la SFET, Chatenay-Malabry). Advances and new technologies in toxinology. 149-152 (2010). Groisillier, A., et al. MARINE-EXPRESS: taking advantage of high throughput cloning and expression strategies for the post-genomic analysis of marine organisms. Microb Cell Fact.. 9, 45 (2010). Vincentelli, R., et al. High-throughput protein expression screening and purification in Escherichia coli. Methods. 55, 65-72 Forthcoming. Xiao, R., et al. The high-throughput protein sample production platform of the Northeast Structural Genomics Consortium. Journal of Structural Biology. 172, 21-33 (2010). Saez, N. J., Vincentelli, R. Ch3 High-throughput expression screening and purification of recombinant proteins in E. coli. Structural Genomics: General Applications : Methods in Molecular Biology. Chen, Y. W. 1091, Humana Press. 33-53 (2014). Katzen, F. Gateway (R) recombinational cloning: a biological operating system. Expert. Opin. Drug Discov. 2, 571-589 (2007). Vincentelli, R., Canaan, S., Offant, J., Cambillau, C., Bignon, C. Automated expression and solubility screening of His-tagged proteins in 96-well format. Analytical Biochemistry. 346, 77-84 (2005). Studier, F. W. Protein production by auto-induction in high density shaking cultures. Protein Expr Purif. 41, 207-234 (2005). Spencer, C. I., et al. Ion channel pharmacology under flow: automation via well-plate microfluidics. Assay Drug Dev Technol. 10, 313-324 (2012). Sala, E., de Marco, A. Screening optimized protein purification protocols by coupling small-scale expression and mini-size exclusion chromatography. Protein Expr Purif. 74, 231-235 (2010). Moon, A. F., Mueller, G. A., Zhong, X., Pedersen, L. C. A synergistic approach to protein crystallization: combination of a fixed-arm carrier with surface entropy reduction. Protein science: a publication of the Protein Society. 19, 901-913 (2010). Zanier, K., et al. Structural basis for hijacking of cellular LxxLL motifs by papillomavirus E6 oncoproteins. 339, Science. New York, N.Y. 694-698 (2013). Kapust, R. B., Tozser, J., Copeland, T. D., Waugh, D. S. The P1' specificity of tobacco etch virus protease. Biochemical and Biophysical Research Communications. 294, 949-955 (2002). Vincentelli, R., Romier, C. Expression in Escherichia coli: becoming faster and more complex. Current Opinion in Structural Biology. 23, 326-334 (2013). Jolma, A., et al. DNA-binding specificities of human transcription factors. Cell. 152, 327-339 (2013). Aslanidis, C., de Jong, P. J. Ligation-independent cloning of PCR products (LIC-PCR). Nucleic Acids Research. 18, 6069-6074 (1990). Haun, R. S., Serventi, I. M., Moss, J. Rapid, reliable ligation-independent cloning of PCR products using modified plasmid vectors. BioTechniques. 13, 515-518 (1992). van den Ent, F., Lowe, J. RF cloning: a restriction-free method for inserting target genes into plasmids. Journal of Biochemical and Biophysical Methods. 67, 67-74 (2006). Vincentelli, R., et al. High-throughput automated refolding screening of inclusion bodies. Protein science: a publication of the Protein Society. 13, 2782-2792 (2004).